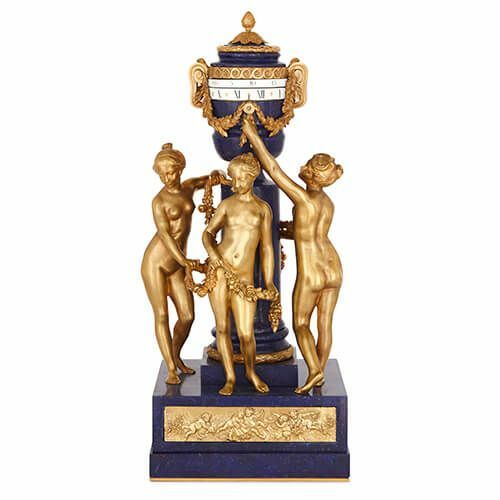 This beautiful mantel clock is a stunning piece in the dark blue gemstone lapis lazuli, and showcases some exceptional sculptural work in ormolu. This unusual cercle tournant mantel clock is modelled on a famous clock by the important 18th Century sculptor Etienne-Maurice Falconet (French, 1716-1791) which now resides in the Louvre Museum, Paris. 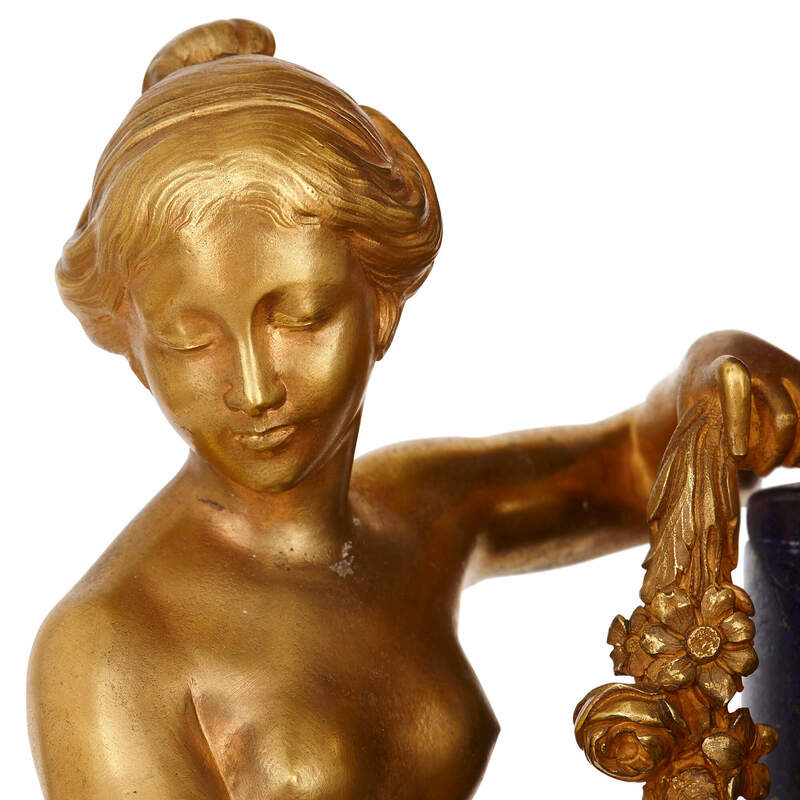 While the original was completed in white marble in c. 1770, this piece combines 19th Century ormolu with a later lapis lazuli veneer to give it an up-to-date, luxurious feel. Falconet was one of the foremost sculptors working in France in the 18th Century, and is perhaps best known for his monumental bronze figure of Peter the Great (Bronze Horseman) which now resides in Senate Square in St Petersburg. 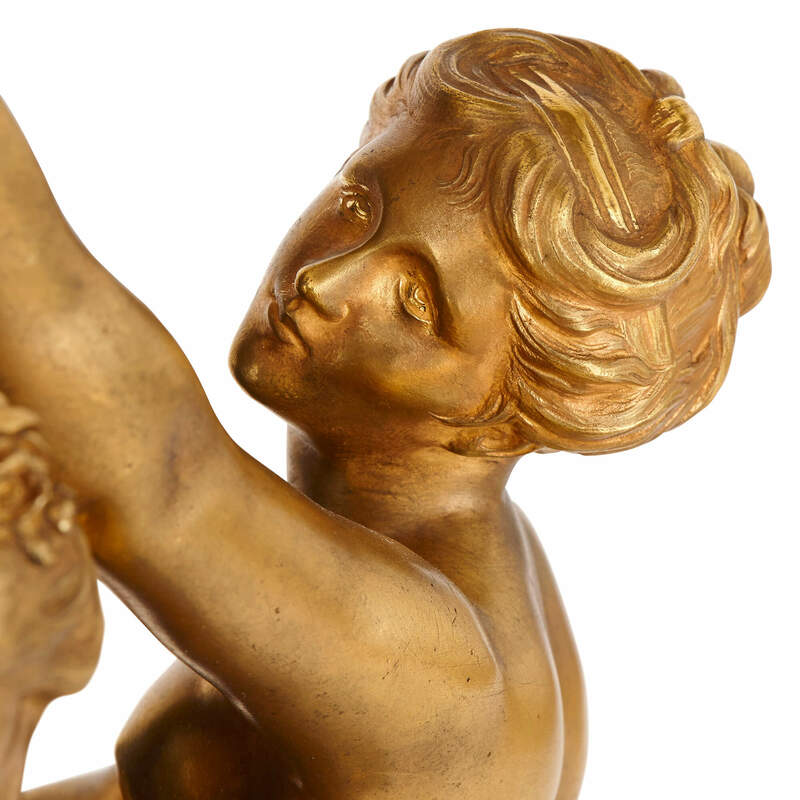 As well as large pieces, Falconet also became renowned for the smaller pieces which he modelled for the Sevres Porcelain Manufactory, at the height of its artistic achievement in the 18th Century. One of these smaller pieces was the original white marble clock he completed in c. 1770, featuring full-length models of the Three Graces. In Roman mythology, the Three Graces were the daughters of Zeus who represented, respectively, youth (Thalia), gaiety (Euphrosyne), and elegance (Aglaea). They were said to preside over all banquets and festive gatherings, making this clock an excellent choice for an antiques-inspired dining room or large hall. 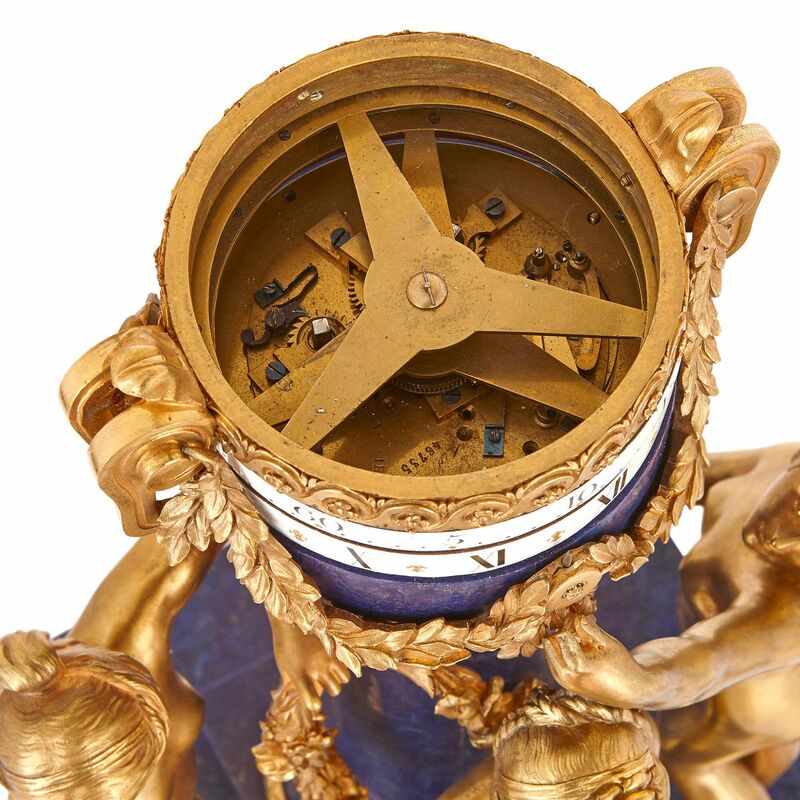 Falconet's clock was acquired in the 19th Century by the French Comte Isaac de Comondo, where it became hugely popular. It was exhibited to great acclaim at the Paris Exposition Universelle in 1900: one review wrote that it had "attracted so much admiration from the crowds gathered around that the pressure was sufficient at times to endanger its safety." After the exhibition the Comte donated the clock to the Louvre. 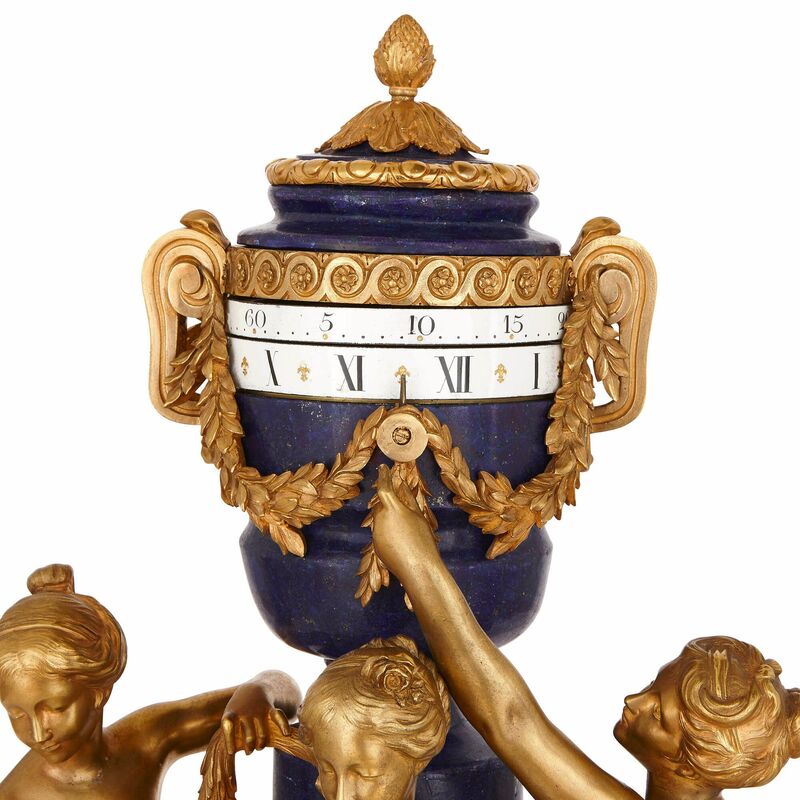 Because of the clock's 19th Century popularity, it inspired a number of replicas in a wide range of materials, including this piece in ormolu and lapis lazuli. 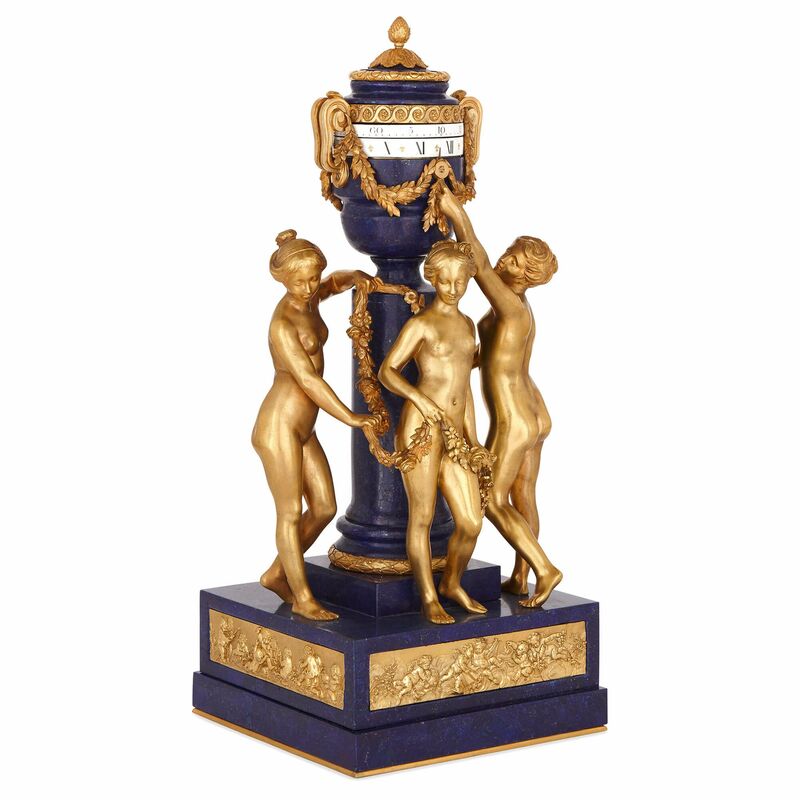 It is modelled as three ormolu figures standing around a central column, which is surmounted by a vase and is set with a central white enamel turning dial. 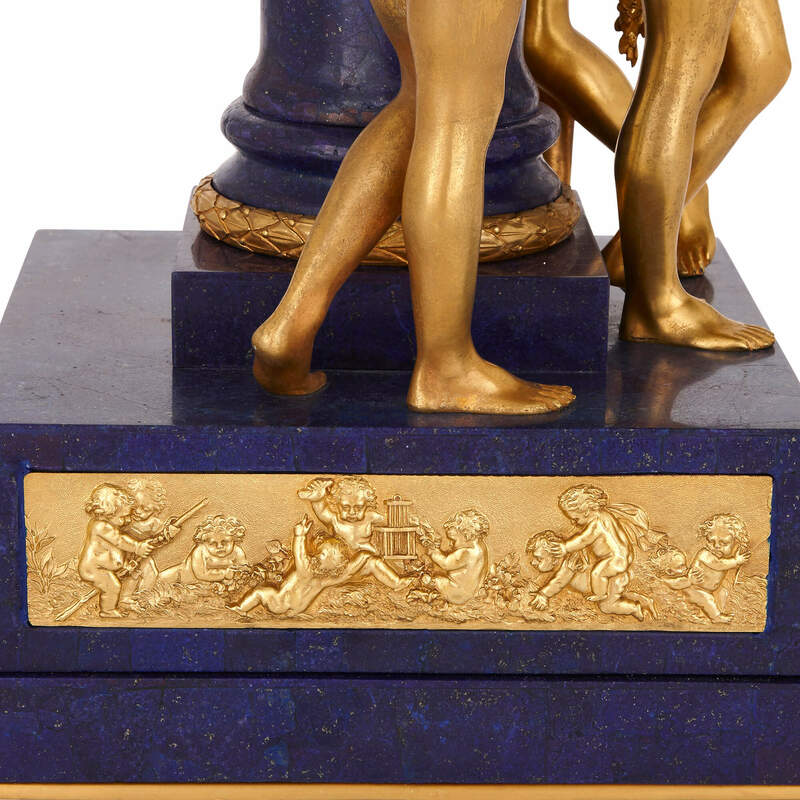 The clock case and figures are mounted onto a rectangular lapis lazuli plinth which is mounted with ormolu relief panels of putti.